The actor, who was known to millions as Coronation Street binman Eddie Yeats in the 1970s and 1980s, died "peacefully in his sleep" on Friday night. It followed a "long courageous battle" with prostate cancer, his family said. 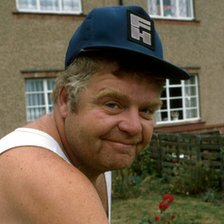 Hughes, who lived on the Isle of Wight, was also known for his roles as Twiggy in TV comedy The Royle Family and Onslow in Keeping Up Appearances. Born in Wallasey, Cheshire on 2 February 1944, Hughes attended Ranworth Square Primary School, Liverpool until the age of 11. He started his career in repertory at the Victoria Theatre in Stoke-on-Trent. This was followed by his first West End production, the Lionel Bart and Alun Owen musical, Maggie May. His other West End productions include the stage version of The Wonderful Wizard of Oz, Say Goodnight to Grandma, The Secret Life of Cartoons and several seasons of Run for your Wife. Among his many other appearances on television are: An Arrow for Little Audrey; The Saint; Shadows of Fear; Z-Cars; Randall and Hopkirk (Deceased); Flying Lady; Making Out; Coasting; Doctor Who; Spender; and Boon. He played 'Trinculo' in an all filmed version of The Tempest for the BBC and 'Squire Clodpoll' in Good Friday 1663, one of Channel Four's new avant-garde operas. His comedy appearances on TV include The Likely Lads, Please Sir!, Dad's Army, Curry and Chips, No, Honestly and The Upper Hand . Hughes' considerable acting experience before Coronation Street and popularity whilst in it meant that he never suffered from the lack of work which often bedevils actors departing long-running series. At Christmas 2008, he returned to play Twiggy in The Royle Family's Christmas Special titled 'The New Sofa'. Hughes was also the Honourary Squire of Dartington Morris Men and made an appearance at the Dartington Morris Ring meeting in September 2008. His musical interests included English folk-rock and he has compered at Fairport's Cropredy Convention annual music festival several times. A couple of omissions from Geoffrey's list of credits given above were the parts of Vernon in Heartbeat, and Uncle Keith in Skins. As he was born close to where I live, the local paper has provided a little extra information that I certainly wasn't aware of: in 2009 he was appointed Deputy Lord Lieutenant for the Isle of Wight, making him the official link between the island and royalty at formal engagements.